In his work from the 1920s to the 1960s, Italian architect-furniture designer Guglielmo Ulrich experimented with new materials and methods, his designs often combining them to create functional forms in previously untried ways. In this article, I plan to demonstrate a readily achievable technique for making one of Ulrich's chair rails, complete with its novel joints that caught my attention. The slim laminar rails with forked ends and flush recessed joints are among the lighter and subtler of his design creations. Here I have emphasised the semi-circular joint detail by the use of woods that contrast in both colour and texture and also by chamfering edges that form the joint. 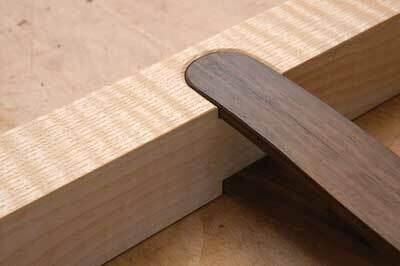 This joint can be modified to work at any angle, or indeed to joint between curved legs. However, the version shown here is made between tapered legs, planed to a straight section where the joint is near the top. The rail is fork shaped at each end. 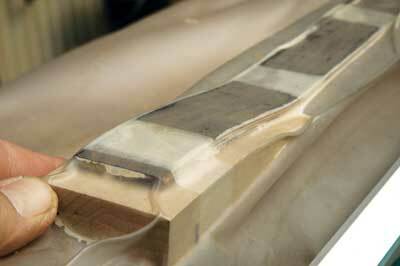 If this were cut from solid it would need to be very much heavier to avoid weakness due the short grained sections. However, using laminated construction means that the long grain curves around, following the shape of the component and providing maximum strength to the fork. Before cutting the laminations I find it handy to mark the end grain with a 'V' shape using felt tipped pen. This helps keep the laminations in sequence when they are re-assembled so the grain figuring is consistent. You need to slice up the wood for the rail on the bandsaw into a series of laminations, then plane the fresh surface after each slice is removed. The bandsaw blade must be running straight without wobble and it must be accurately aligned. 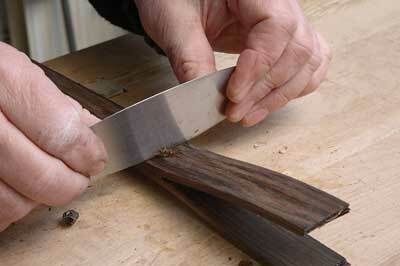 The fence must be set with a gap of approximately one millimetre from the blade for laminations of this thickness. The forked ends of the rails need to be moulded into shape around a solid wedge-shaped former, holding them apart at the correct angle and spacing while the glue sets. 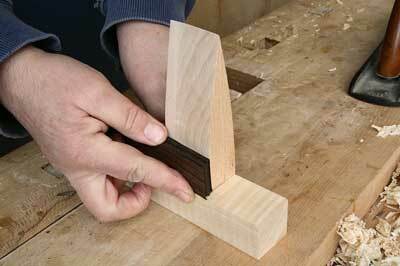 The thickness of the wedge is sufficient to spread the forked rail end wide enough to match the leg thickness. You can test this by adding the thickness of the wedge to the thickness of the bundle of laminations and checking it is approximately equal to the thickness of the leg. Because there will always be a small amount of spring-back in a laminated component after the glue has set, the thickness and curvature of the formers should be slightly exaggerated. There is bound to be glue squeezed out during the pressing operation so the formers must be coated with a releasing agent. 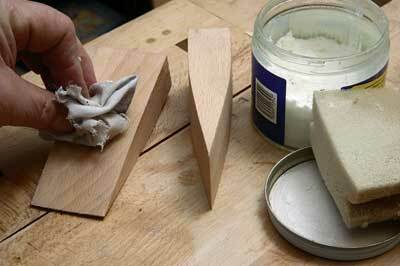 I used a thin polishing wax paste for this and soak it well into the block, which in this case is made from beech. MDF is also suitable but rather fragile when shaped thinly. Once the bundle of laminates has been glued together it will become much stiffer. 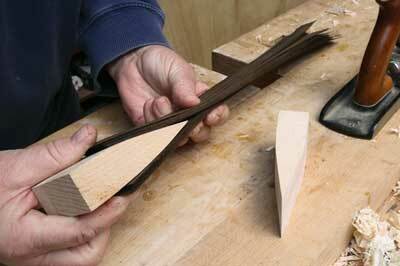 How much depends not only on the finished thickness but also on the type of glue you use. 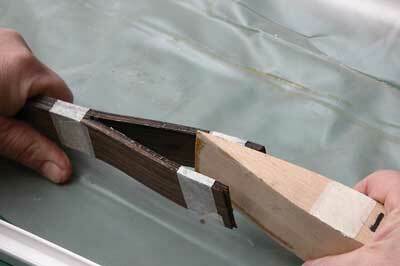 Resin glues will be stiffest and have the advantage of filling gaps, especially if the laminate surfaces are rough. PVA type glues produce a more flexible component which is still pretty rigid but more resistant to cracking. 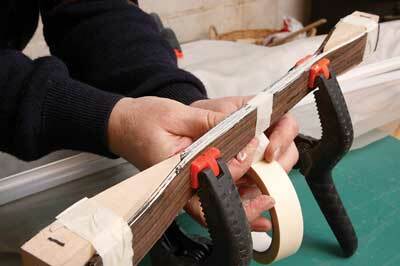 As with all gluing operations you need to be well prepared with glue, masking tape, clamps, etc. 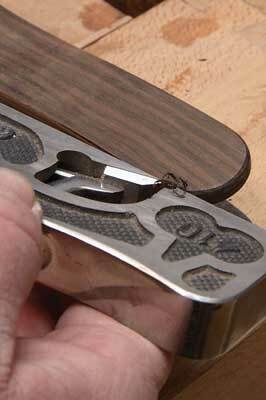 readily to hand so you can move quickly, pulling the component together before the glue starts to set. I brushed glue evenly across one face of each lamination layer-by-layer building up this small component. 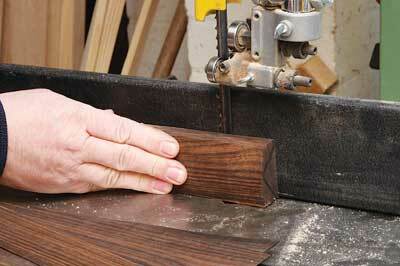 Bigger areas of laminate would benefit from glue applied with a roller to speed up the process. We need to produce two separate bundles of laminations for the rail, bound together at the ends, and then to glue and bind these two together in the middle section to form a single rail with forked ends. 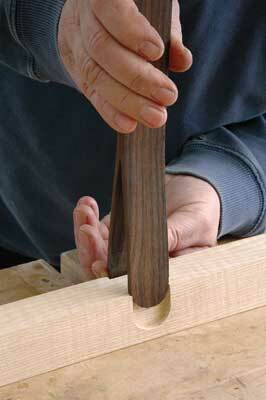 The wedge-shaped formers must be pressed into the forked ends, holding them apart. I used a vacuum press bag to hold the laminations in shape while the glue set, but this is certainly not the only method available. Alternative to vacuum pressing One more traditional way of pressing laminates would be to surround the component with a full set of four formers, the extra two being used to press the outer faces of the rail together. This avoids the need for a vacuum press. The disadvantage of this method is that the outer formers must be very carefully shaped, allowing for the thickness and curvature of the lamination bundles. Even so, they are unlikely to achieve the large well-distributed pressure that a vacuum bag can supply. 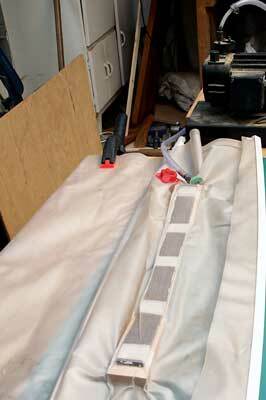 The vacuum bag uses the natural pressure of atmospheric air to squeeze the contents together. This does not need a very high vacuum; a small single stage electric pump is enough to extract most of the air from the tough PVC bag, allowing atmospheric air on the outside to apply a pressure of around 1kg per square centimetre or 10 tonnes per square metre. Using a vacuum bag for this sort of job will take up the form of any awkwardly shaped object inside and apply an even pressure in all directions. With the two bundles of laminations and two formers sealed into a bag and vacuum applied, the PVC sheeting squeezes beads of glue from the edges of the laminates. 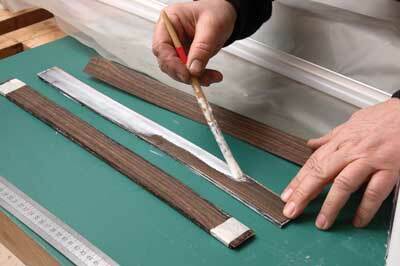 PVC is quite resistant to gluing and the finished piece is easily removed. Once the glue has set the vacuum pump is disconnected, the rail bundle removed from the bag and the formers pulled out from each end. 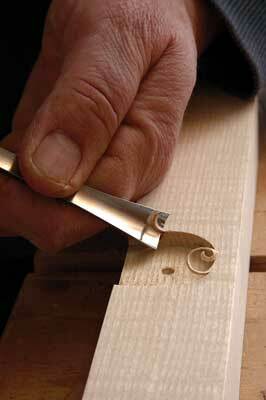 The rail edges are then planed to remove hardened glue, straightening them up to the appropriate width. I chose a width of exactly 30mm to match the diameter of a suitable drill bit that I would later use to cut the joint sockets. The faces of the laminated rail can be smoothed with a cabinet scraper but it is best to avoid scraping too deeply as this might cut through the outer lamination, exposing part of a glue layer on the face. 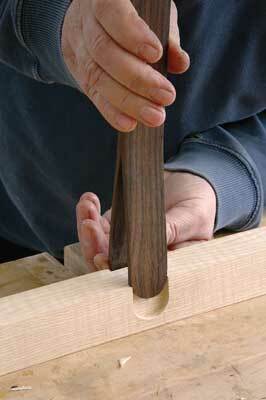 Each forked rail-end fits into a pair of sockets, one of which is cut into each face of the corresponding leg. 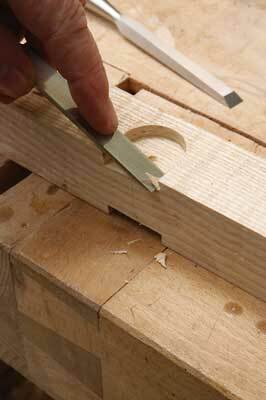 The depth of the socket must correspond with the thickness of the forked rail-end if the finished joint is to be flush. I marked out the sockets then shaped them on each side of the leg first using a Forstner drill bit to produce a clean-sided round hole, then a chisel to form a straight-sided round-ended socket. First the rail ends are trial-fitted into their corresponding sockets and may be trimmed as necessary so they seat evenly. Secondly the rails, complete with their well-fitted dry joints, are trial-fitted between pairs of legs to ensure the spacing and alignment is accurate. At this stage they may be glued up and clamped, but there is one more detail that I sometimes like to apply to this kind of joint. As a visual and tactile enhancement to these joints I decided to micro-chamfer all around the rail and the corresponding inner edges of the socket. 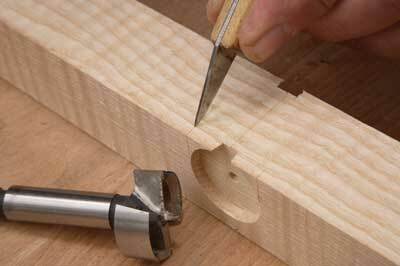 This picks out the joint detail and gives it a more solid appearance. 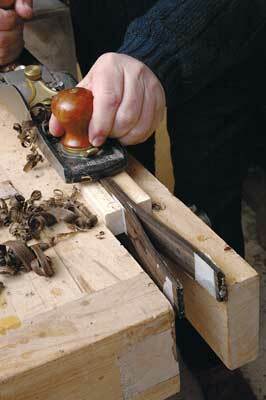 I cut the rail chamfers using a small block plane working slowly along each edge and around each rounded end. After this I cut the micro chamfers around the edge of each socket with a gouge. 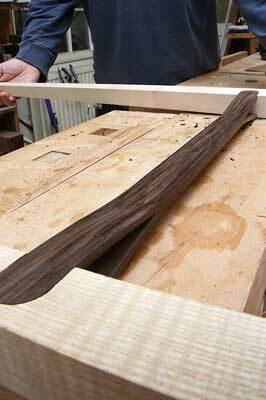 The chamfered rails are then ready to be glued up and fitted to their sockets as part of the furniture assembly. The rail ends are marked to length then shaped into semi-circles, first by sawing them just oversize, then using a gouge to trim away the ends. 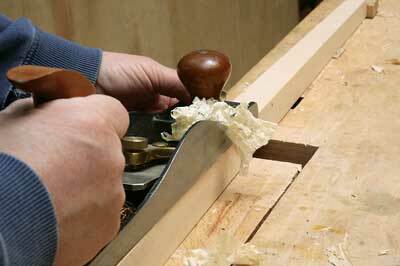 It is important to support the laminates well when sawing and chopping so they don't splinter or delaminate. 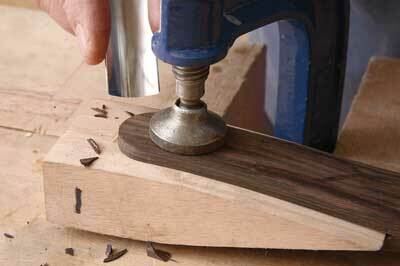 Finally the end grain can be smoothed with a fine-toothed file or a hard sanding block. Thanks to Guglielmo Ulrich these forked rails and their rounded joints are visually attractive and functionally strong. If the dimensions are kept thin, laminated constructions like this can also be quite pliable, which is a desirable feature in lightweight chairs. Ulrich, born in Milan in 1904, was one of the most sophisticated designers of his time. Described as a man of refined taste, he was aristocratic and attracted to rare materials. After graduating from Milan Polytechnic in 1927, Ulrich went on to co-found ARCA - Arredamento Casa/House-furnishing - in 1930. Backed by Renato Wild, a wealthy Swiss, the company name was to become a coveted brand among the Milanese bourgeoisie, and Ulrich's name became synonymous with original and perfectly executed work. Ulrich is recognised for his understanding of form and function, as well as for his willingness to experiment with rare and untried materials. His lights, furniture and accessories are characterised by leather, fur, rare woods - such as cedar and zebra wood - mica, pristal, xantal and anticorodal. He remains a seminal figure in the world of Italian design.